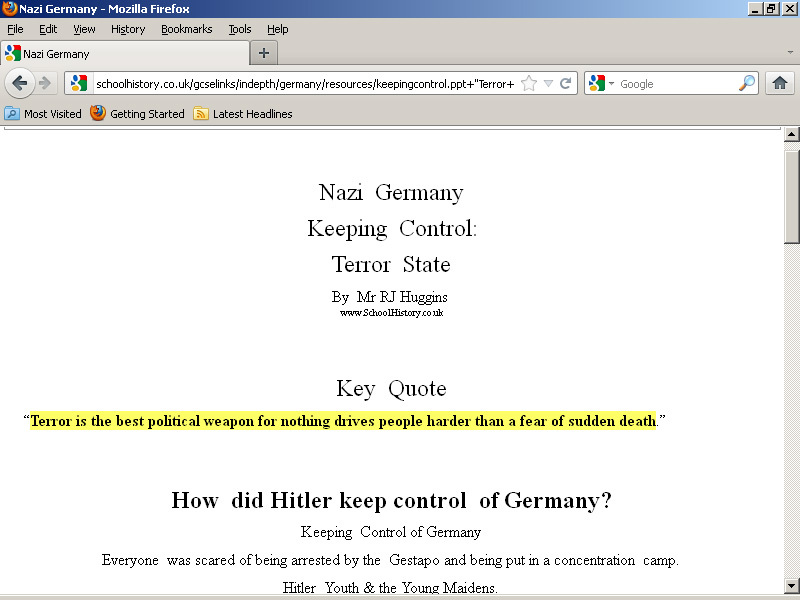 National-Socialist Worldview: A Fake Hitler Quote about "Terrorism"
A Fake Hitler Quote about "Terrorism"
Vic Fury referred me to an article on Buchanan.org titled, "Given Everything That's Happened." This was originally posted on Washington's Blog. The subject of the essay is false-flag operations. The author uses the ludicrous example of the Reichstag Fire, well known not to have been a false-flag operation, and "Operation Himmler," which was a far-fetched story told at Nuremberg to put all war-guilt on Germany. Conspicuously not mentioned is the Lavon Affair. The fact that Mossad was caught setting up a fake al-Qaeda cell in Gaza is also not mentioned, nor the fact that Mossad engineered the Achille Lauro incident. These omissions are particularly striking given that the probable motive for any false-flag operation involving the U.S. these days is the interest of the State of Israel. For some reason, it often happens that the aversion to blaming the State of Israel is coupled with a tendency toward uncritical repetition of World War II propaganda. 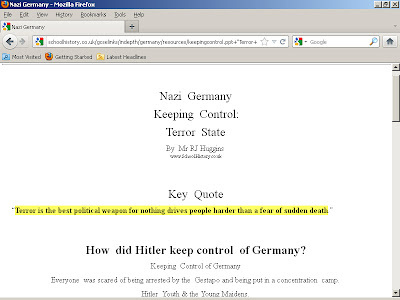 This alleged Hitler quote can be found on a number of conspiracy sites but it is completely fake. There is another, probably pre-911 version of this fake quote, that is identical except that it uses the word Terror instead instead of Terrorism. The alleged quote is cobbled together from two sentences in Hermann Rauschning’s The Voice of Destruction, a collection of alleged conversations with Hitler that never really occurred. Rauschning's fiction is quoted very often in anti-Hitler propaganda, and often brazenly misquoted. The alleged Hitler quote on Washington's Blog is a highly distorted version of the fake quote on page 84 of Rauschning's The Voice of Destruction. I have underlined the words that were cobbled together from the old false quote to create a new false quote. "Terror is the most effective political instrument. I shall not permit myself to be robbed of it simply because a lot of stupid, bourgeois molly-coddles choose to be offended by it. It is my duty to make use of every means of training the German people to severity, and to prepare them for war." Hitler paced the room excitedly. "My behavior in wartime will be no different. The most horrible warfare is the kindest. I shall spread terror by the surprise employment of all my measures. The important thing is the sudden shock of an overwhelming fear of death." The word instrument was changed to weapon, and the words "for nothing drives people harder than" were inserted, plus a couple of other changes. Whoever cobbled together those words from Rauschning and called it a quote knew that he was committing a fraud. This is very much like some fake quotes from Frank Capra's Why We Fight that I exposed in an earlier entry here. Capra's screenwriters used Hermann Rauschning as a convenient (fraudulent) source of ugly Hitler quotes, but couldn't even present Rauschning's text accurately. They took the already fake quotes and altered them to suit their needs, which is obviously how this alleged Hitler quote was produced as well, although I do not know that it was Capra's people who did this one. Somebody named "Mr. RJ Huggins," who seems to be involved in "Holocaust education" in Britain and Hong Kong, made a Powerpoint presentation (posted on the site of the King George V School in Hong Kong) featuring this fraud as his "key quote" to support his view that "everyone" in Germany was "scared of being arrested by the Gestapo and being put in a concentration camp." The fake quote was central in this presentation for schoolchildren. I informed Mr. Huggins by e-mail that I believed the quote to be bogus, expecting that he might reveal from what seemingly credible source he had derived his spurious "key quote," but got no response.